Are these the schools of the future? – AskSalome! Nancy Otero, founding director of research and learning design at the Portfolio School, and a student at the school which favors creativity over testing. (CNN) Whether school years were socially awkward or the happiest days of your life, this time (hopefully) brings back lifelong memories and a tinge of nostalgia for the majority of grown-ups. It was also likely a time defined by strict timetables, rigid lessons, and unforgiving homework. Testing, too, was probably a big part of anyone’s educational experience no matter where they lived. Depending on how well one performed on tests, it often meant certain doors were open — or closed. Imagine a school now, though, where students choose their own curriculum and teachers are more like mentors guiding them through activities and topics of interest. Instead of homework and tests, portfolios and exhibitions would display your films, writing, art, and creations, and you were constantly encouraged to keep doing more. A new wave of schools are increasing in number, particularly in the U.S., many of them flipping the traditional style of schooling to a more personalized-style of education. A little girl plays at the Portfolio school, which opened a year ago. Portfolio School is a project-based start-up school in New York’s Tribeca neighborhood, which emphasizes guided choice and a personalized education, mixing technology with learning activities. The school calls itself a “micro-school”, which aims to broaden a child’s creativity and is based on the philosophy that children need an interdisciplinary model of learning. Currently, the school has 19 students ranging from ages 5-10 in a single open-plan multi-purpose space with plans to grow to 80 in two years. Portfolio says its research-based approach is reinventing everything — from the curriculum, space design, classroom management, schedule, the role of teachers and a student’s engagement with the outside world. One way of achieving self-motivation is by giving power to the students, said Nancy Otero, a former software engineer who is the director of research and learning design at Portfolio. “Our school is more like a studio. Things are open all the time. We have drills, 3D printers. We give them these powerful tools, where they can code and construct,” said Otero. Children at Portfolio learn to build and assemble, using all sorts of tools. Kids can make things out of plaster, they can speak, write, make videos. “Technology is not viewed as something frightening. It’s one of multiple tools,” said Dr. Shira Leibowitz, director of the lower school at Portfolio. At traditional schools, there isn’t much time for most of this. “You need large amounts of time to tinker and play and those schedules (of traditional schools) are very conforming,” said Leibowitz. There’s a policy of no homework at Portfolio. “Research has shown it’s not a useful thing. Some of the kids start not wanting to learn so much (with homework),” said Otero. Other similar schools in the U.S. — mainly clustered around, unsurprisingly, California’s Silicon Valley — have cropped up thanks to parents who have worked in technology. Co-founder and CEO of Portfolio, Babur Habib, and co-founder Doug Schachtel, who runs operations of the school, came up with the idea for Portfolio over a game of squash at their alma mater Princeton University. Both have had successful careers and now have young children and felt there needed to be something different, something that wasn’t already available. AltSchool was created by a former Google executive who felt frustrated by school choice for his own kids. 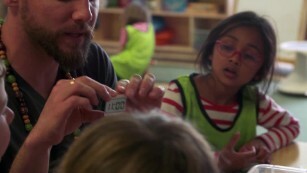 In a similar way, the California-based AltSchool is a group of micro-schools founded by former Google executive Max Ventilla. His financial supporters include Mark Zuckerberg among many other Silicon Valley executives. 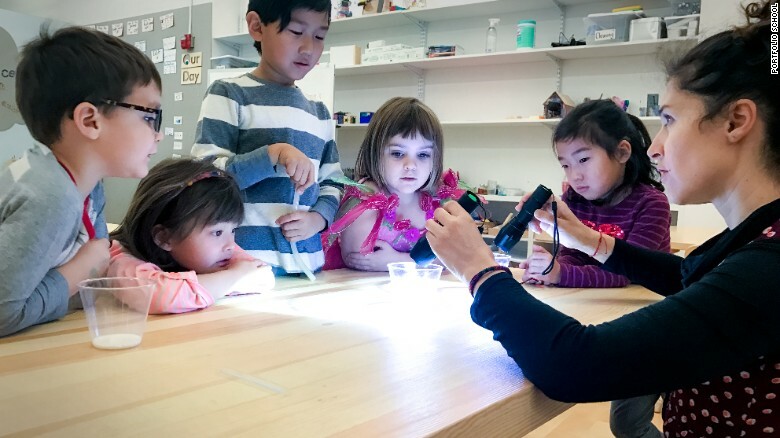 AltSchool now has schools in California and New York. In Boston, former Google executive Sep Kamvar started Wildflower School in 2014 after it evolved from a project within the MIT Media Lab. It has grown to many more locations since. By taking away the traditional U.S. grading system of A, B, C, D, F, Portfolio say it’s liberating students instead of holding them back. “There’s no end limit. In a traditional school if you get an A+, that’s it. We’ve taken away that ceiling so that they (students) keep going. We keep stretching,” said Leibowitz. 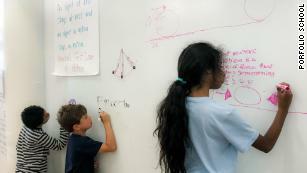 Children independently problem solve on walls made of whiteboards. We’ve created an environment which does two things, said co-founder Doug Schachtel. Portfolio fosters creativity and innovation by enabling students to pursue their interests and giving them space and time to go explore them, he said. The school also ensures students learn the core skills of reading, writing and math at their own pace. “We’ve achieved this innovation not through a software program but being really thoughtful about all the aspects of school,” he said, when asked about other similar schools. Only 19 students currently attend the Portfolio School, but it plans to have 80 students in two years. “That’s an opportunity that would never have been there in any other classroom,” said Marantos, of the experience of mixed age groups working together. Marantos also praised the positive shift away from being the kid who gets the award or the best grades in class to the one who’s creating something incredible. Another mother at the school agrees. “Portfolio believes every child is a genius. They don’t dumb down the content because of their age and they stretch the kids beyond their comfort zone. 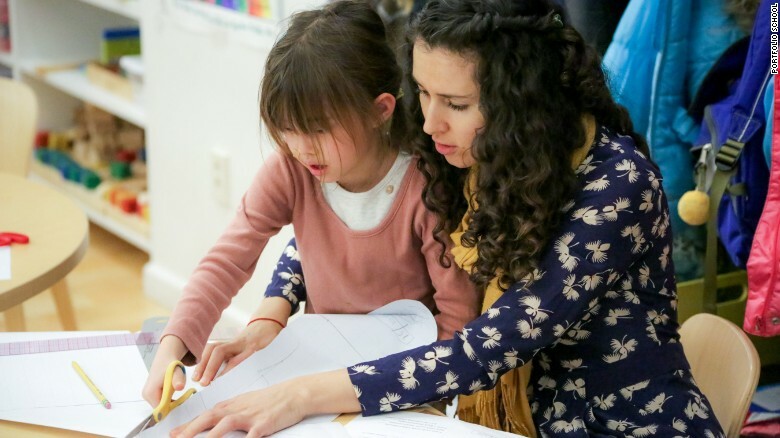 At the same time, the teachers know the kids well and recognize each has different strengths and weaknesses, and they challenge them with great compassion,” said Jackie Tian. Some say it’s too early to know what results will be seen from experimental schools. “There’s a lot of great innovation in schools right now. Project-based learning can intrinsically motivate students to be creative and explore their own interests — not just for the sake of a test score or grade. We do a disservice to students though if we shortchange foundational learning. There needs to be a balance,” said Karyn Wynn, a school administrator based in Palo Alto, California. With a balanced approach, Wynn praises project-based learning. She says the current system of rigid testing causes too much pressure and the stakes are “ridiculously” high. “It’s great to have more creative energy in the education field. We do need to reimagine what is possible,” she added.